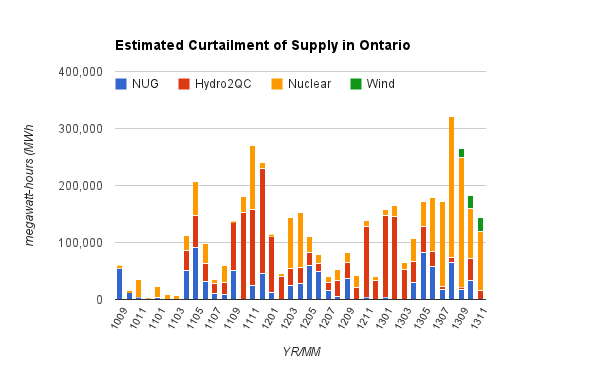 I've just developed some queries to estimate the curtailment of wind supply on the Ontario grid, and thought a quick, primarily "stats", post might interest some of my readers. This also provides an opportunity to review methods that the Independent Electricity System Operator (IESO) uses to reduce supply, and the limitations of estimating those curtailment actions. Wind curtailment, which became possible on September 11th, 2013, as a result of the IESO's renewable integration initiative. On September 10th the IESO changed it's "Generators Output and Capability" report to indicate the "forecast" for the hourly output from industrial wind generators. The difference between the "forecast" and the "output" appears to provide a method to estimate the amount of wind curtailment: in the 30 days from September 11 to October 10, the sum of the differences is 28,053 MWh, while the IESO has presented dispatch of 28GWh for the same period. In the 66 days since curtailment of the wind resource was introduced, curtailment is approximately 61GWh - at any average price of $120 that would equate to a cost of $7.3 million (~$110,800/day) if suppliers are reimbursed for curtailment. One of Kathleen Wynne's first acts of Premier appears to have been forcing an agreement to pay the wind companies for curtailed supply - although the details of a settlement that got suppliers to halt proceeding at the Ontario Energy Board are secret (the board should have refused to hear them anyway). There is a lot of area of uncertainty in my estimates of nuclear curtailments, in that the estimates are based on when Bruce Power's nuclear units are operating in the range characterized in a reduction maneuver. If a unit is running at a reduced level for technical reasons my estimates include it as a curtailment. However, if a unit is completely powered down due to an extended period of surplus, my estimates do not show it. The IESO reported that "The total loss in nuclear energy due to SBG [surplus baseload generation] as of May 15, 2013 is 310 GWh..."
My estimate is only 97GWh (nuclear steam bypass only). Conversely, in August Bruce's unit 3 ran at reduced power almost the entire month, which is captured as curtailment in my estimates, but probably isn't. While the science of estimating using only data algorithms is not precise, it's much better than not estimating - and my weekly and monthly charting of the estimates shows they are generally valid. 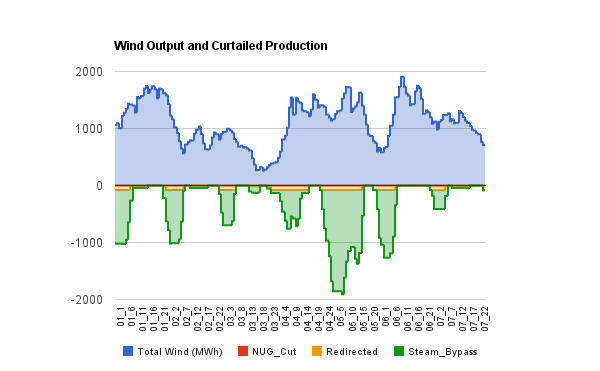 It's important to remember that there is more curtailed than wind; in fact wind curtailments appear to be only about 20% of nuclear curtailments thus far. "Bumped" indicates curtailments that were made while an equal amount of wind output was being purchased"
The numbers from the weekend are remarkable. Ontario's electricity sector essentially paid more to curtail supply than it received from generation this weekend. The total cost of curtailments is therefore estimated at $4,599,571, which is 31% more that the entire market value of all the production that was not curtailed.